Shapeways, an online maker and seller of 3D printed products, contacted me asking if I would be interested in reviewing their products. I’ve been interested in 3D printing for a while, and loved the chance to see some items up close as well as ask one of their designers some questions about the process. I picked out two products in different materials so I could see a variety, and I just happened to pick out two Harry Potter-inspired items. 😉 Check out my reviews of the products and an interview with Designer Evangelist Duann Scott, as well as Seedling Design shop owners Chris Schmidt and Megan Ender. 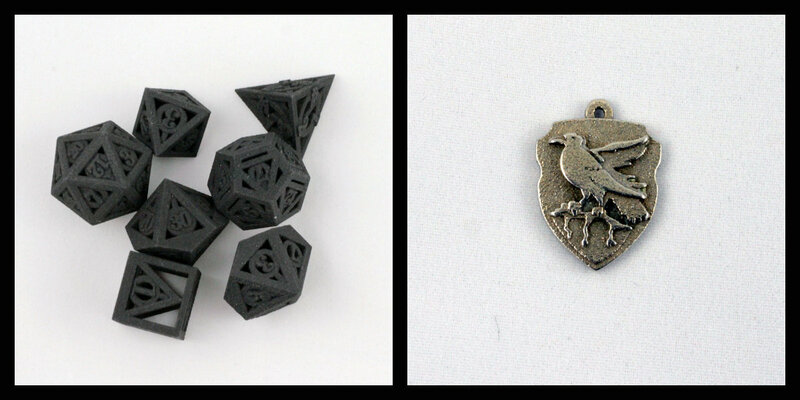 3D printed dice sets are ridiculously awesome. You can play around a lot with the individual shapes and designs and you can make it out of so many different materials. I chose to have my dice set made out of “Black Strong and Flexible” as it seems to be a 3D printed standard. The material is extremely lightweight but feels nearly indestructible. The design of the dice itself is beautiful, but a bit difficult to read in its normal state. The link has some great examples of dice that have been painted, so I’ll most likely be doing that to my dice very soon. Although I’ll always be a little bit Hufflepuff at heart, Pottermore sorted me into Ravenclaw and I feel like it was time to rock the crest. Ordering this gave me a chance to check out 3D printed metal, and it’s pretty cool. I got the pendant in stainless steel, and it looks like a nice piece of jewelry you’d get anywhere else. The steel is almost a bit gold/bronzeish in certain light, has a textured look to it, and has a good weight to it. The design itself has quite a bit of detail and looks almost stacked on each other. I can’t wait to put it onto a chain and wear it around! 1. Why 3D printing? What makes it so much better than other methods of creating? Duann: 3D printing makes it easier for people to make exactly what they want in a range of materials from plastics to stainless steel, ceramics to Sterling silver. Because you can make an object exactly the way you want it, you do not need to settle for a mass produced item that is ‘close enough’ to what you want. With 3D printing, it does not matter how complex an item is, as the cost is calculated by the amount of material used only. 2. What type of object is most recommended for 3D printing? Anything that doesn’t work as well? Duann: When you make anything, be it a bike or a cake, it is important to choose the right tools and the right materials, the same is true with 3D printing. Laser sintered Nylon is incredibly versatile in that you can make anything from a structural furniture component to an iPhone case, a fully articulated garment to a static bracket, it is important to design to the material limitations. 3D Printing is currently best used for smaller complex parts, it does not make sense to 3D print one hundred thousand golf tees, unless each one is unique. 3. You have a variety of materials available for 3D printing. Any new materials coming to the site soon? Anything you’re working on? Duann: We currently have over 30 material options on Shapeways, a range of plastics, ceramics and precious metals. Over the coming weeks we will be introducing more jewelry grade precious metals to our material option. We have some really exciting new materials that will not be available until early 2014! 4. What are your tips for someone that wants to create something through Shapeways.com? Duann: When designing for 3D printing with Shapeways, it is important to use the right 3D modeling application and material for your project. If you are doing organic forms I recommend a surface modeler, if you are doing mechanical parts it is easier to design with a solid modeling application. Choosing the right material is also very important, if you have a functioning part I recommend Nylon or Stainless Steel, if you are looking for and incredibly high detail our Acrylic has details down to the microns, and if you are designing jewelry, our Sterling Silver and Gold Plated Brass is beautiful. Chris and Megan: 3D printing allows you to create anything that you can imagine, but it’s important to really get to know the technology. Designers and artists who take the time to become experts in 3D printing will definitely be forefront of cutting edge technology. Interested in learning more about 3D printing or getting something printed yourself? Check out Shapeways.com! And let me know your thoughts on 3D printing in the comments. We used Shapeways to 3D print us in Minecraft for our wedding cake toppers.